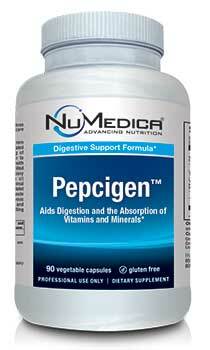 Numedica Pepcigen is a powerful nutritional support that promotes a health digestive tract. 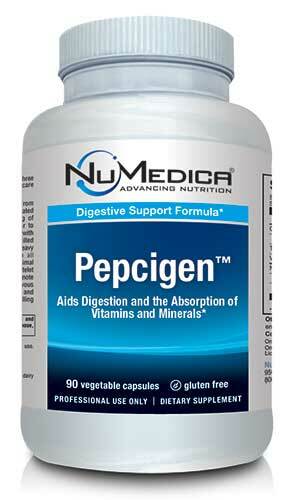 Pepcigen is formulated with safe and effective ingredients that are known to support digestive health. NuMedica Pepcigen is formulated with the glutamic acid, also known as glutamate, an amino acid that can be found naturally in the body. Glutamic acid plays a key role in the metabolism of fats and sugars. It can also help reduce the symptoms associated with indigestion like gas and bloating. If you find you suffer from slow digestion or experience periodic indigestion with its discomforting symptoms, you might benefit from NuMedica Pepcigan with its stores of glutamic acid. NuMedica Pepcigen is designed with gentian root, which is a bitter root that has long been used as a digestive remedy in European herbalist traditions. Many people have found that bitters like gentian root can positively impact sluggish digestion and even improve poor appetite. The inclusion of this herb in NuMedica Pepcigen makes the formula all the more viable for combating the symptoms of indigestion. NuMedica Pepcigen features the enzyme pepsin in its formula, which adds to the all-around strength of this natural supplement. Pepsin is naturally found in gastric juices and helps break down tough proteins that are found in eggs, meat, and dairy foods. With an optimum amount of pepsin, the body can more easily digest these types of protein-rich foods. Pepsin and other ingredients contained in NuMedica Pepcigen enhance the body's ability to absorb vitamin 12 and other important nutrients during the digestive process. Directions: Take one capsule after meals or as directed by your practitioner. Caution: Do not use if history of a peptic/duodenal ulcer.